In 2018, more Americans have died in schools, with twenty-nine people killed, than in military service, where thirteen troops have been killed. Yes, the statement that more Americans have been killed in schools than military service thus far in 2018 appears to be accurate. The exact numbers in the tweet are inaccurate, and the comparison isn't entirely reasonable and might mislead into thinking the risk to a schoolchild might be similar to that of military personnel. This is not usually the case. 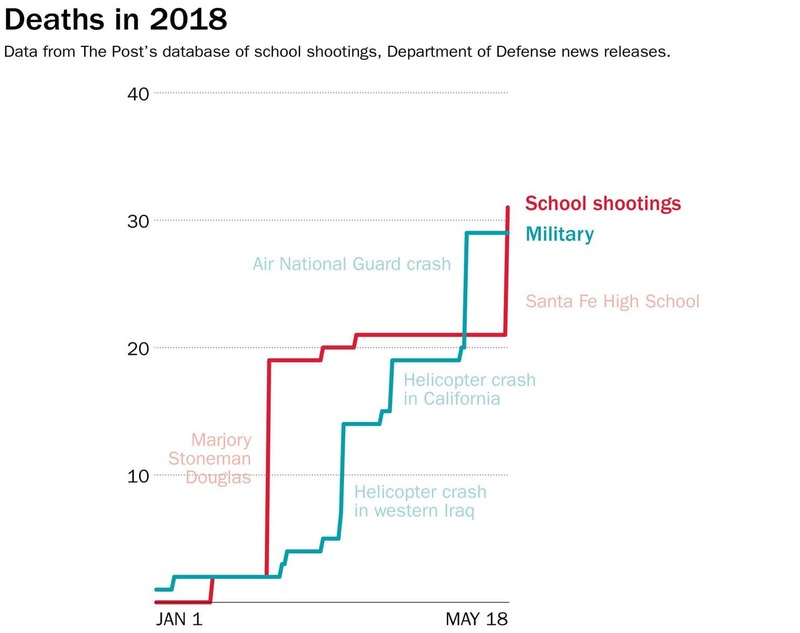 In 2017, the number of fatalities among service members was far higher than the number of people killed in school shootings, according to The Washington Post data. The figures for 2018 do not suggest schools are more dangerous than combat zones. After all, there are more than 50 million students in public elementary and high schools and only about 1.3 million members of the armed forces. So far in 2018, a member of the military has been about 40 times as likely to be killed as someone is to die in a school shooting, including Keller’s revised figures.